Essie has released a beautiful 6-piece Valentine's Day Collection for 2019! Essie's limited edition Valentine's Day 2019 Nail Polish Collection features inspired nail polishes and glitter top coats that are even more fun when paired together. On a mission for love? Be mine in this red matte glitter top coat with hints of pink and fuchsia. Use alone or over Essie color nail polish. Exclusive easy glide brush for quick, even application and a shiny, smooth appearance. Hello Lovelies! 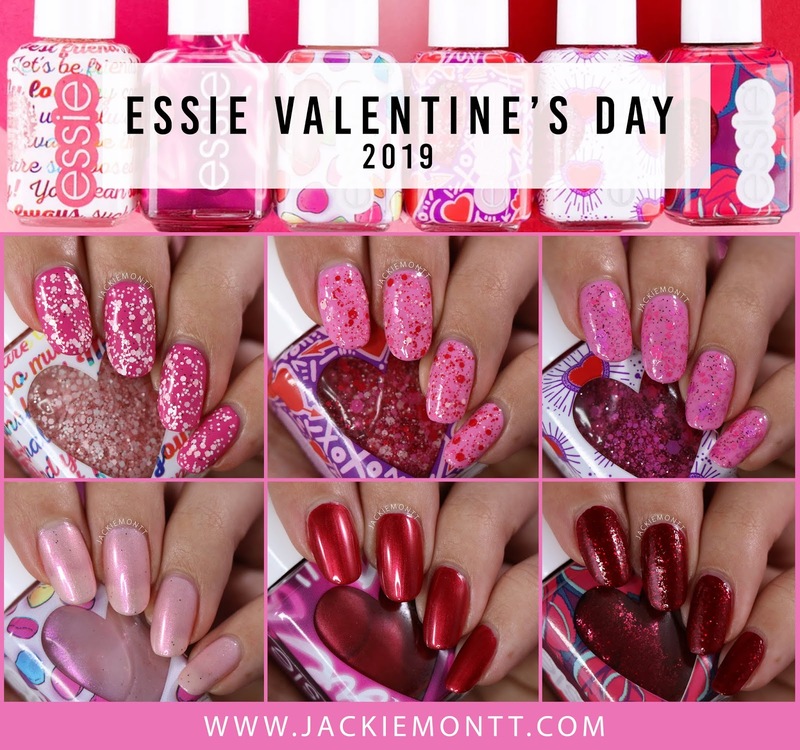 Today I have the Essie Valentine's Day Collection for 2019 to share with you. This was a surprise collection for me. I stumbled upon it at a Duane Reade (Walgreens of NYC) and decided to "just pick up three". Well that was short-lived. I brought these beauties home and then immediately went back out and got the other three haha. This collection is limited edition, and is comprised of six shades. Three are glitter toppers, two metallic(ish) polishes, and one glitter polish. I really like the unique packaging for this collection, and I think they are so so cute! They are also the perfect way to spruce up your mani for Valentine's Day if you don't have time to do fancy nail art - or hit the nail salon. Each of these polishes are $9 each, and you can find them at your local Walgreens/Duane Reade, or online at Target and Ulta. GALENTINE | Galentine is a white and carnation pink matte glitter top coat nail polish. I used 2 coats of this over Essie "The Fuchsia Is Bright". YOU'RE SO CUPID | You're So Cupid is a red matte glitter top coat nail polish with hints of pink and fuchsia. I used 2 coats of this over Essie "Cascade Cool". I really liked this topper, and I love the variety of shapes, sizes and colors! SPARKLES BETWEEN US | Sparkles Between Us is a fuchsia pink matte glitter top coat nail polish. I used 2 coats over Essie "Cascade Cool". CRUSH & BLUSH | Crush & Blush is a sheer baby pink nail polish blushing with soft ruby iridescence, and little silver glitter. This polish never reached opacity on its own for me, but it got close. I would use a base coat of white with this next time, because the color IS gorgeous. This was 3 coats. #ESSIELOVE | #essielove is a scarlet red pearly nail polish. I love how gorgeous the finish is on this, and the formula was so amazing. The first coat seems pretty sheer, but it builds up perfectly in 2 coats. ROSES ARE RED | Roses Are Red is a bordeaux red jelly polish packed with red sparkles. This polish is close to "Leading Lady" from the Essie winter 2012 collection. I will be posting comparison swatches on my insta! This was 3 coats for full coverage. Overall, this is a really cute collection - but it's probably not one that I will be getting a ton of use out of. I will say, I want to try to use up my toppers this year, so I will try to use the glitters this Valentine's day (on myself, and my friends!). My favorites are You're So Cupid and #Essielove. I just think these two are the most unique to my collection, and they're so pretty.